Join us in Playa del Carmen for a wild day of extreme adventure that could only be hatched from the twisted minds of Selvatica. If you are looking for excitement and an adrenaline filled adventure, laughs and fun, this is for sure the perfect tour for you, a trip full of extreme sports and more. 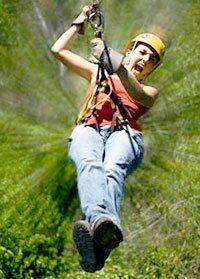 To start you'll fly on a 10 Extreme Zip Lines circuit on the #1 canopy tour in the region. On this tour you can zip upside down or backwards, every which way but loose, fly from tree to tree on this exciting tour. Then get ready to walk on air bridges and swing on giant ropes too! But that's not all you will also get to enjoy the outrageous Tarzania Human Roller Coaster. The most exciting part is of this tour is when you get to fly like SUPERMAN! Take a head-first flight over the jungle on monster zip lines! Now that you are back on ground, we are ready to start our engines on our Polaris RZR 4x4 vehicles for an amazing ATV adventure you won't forget. Drive in the jungle trails and enjoy a great unique ride. Our next stop on this tour is a place where you can relax, cool off and enjoy a refreshing swim in the clear waters of a hidden cenote in the middle of the jungle. A great combo tour that includes seven amazing adventure tours all in one! When: Monday through Saturday at 9:00 AM. Kids: Ages 8 and up. Kids prices apply to ages 8 to 15 years. Must be at least 16 years old, have a valid ID and credit card for security deposit to drive. All minors under 18 years old must be accompanied by a parent or guardian.